People who like rock climbing are apparently more likely to enjoy eating gruel and poppy seed rolls, live in Wales, be middle class and describe themselves as analytical and practical, but occasionally neurotic. This is according to YouGov Profiler, a new, free app that allows you to look at survey data from polling company YouGov. It’s designed as a taster for the much more in-depth, paid-for YouGov Profiles that is YouGov’s segmentation and media-planning tool for PR agencies and brands. It’s quite fun to input random things into YouGov Profiler to see what it can tell you about people and their interests. However, looking through the occasionally quirky results from this app made me wonder if some people are admitting things in surveys that they aren’t sharing with their friends at the crag or if YouGov might need to talk to a few more climbers. Some of the YouGov Profiler results for people who like rock climbing are potentially quite useful from a marketing point of view, but a little dull. 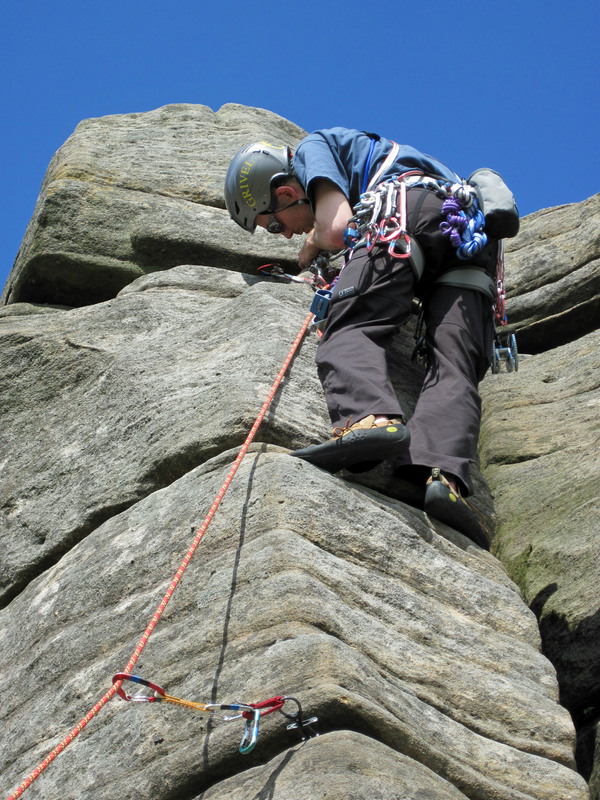 Rock climbers are more likely to be aged 25-39, social grades ABC1 (i.e. middle class and in a managerial or professional occupation) and work in Research / R&D. However, some of the results tell me things I would not have guessed. Apparently one of rock climbers’ favourite celebrities is Gwyneth Paltrow. I’m guessing that this is because of her performances in the Iron Man films and her dedication to leading a healthy lifestyle. 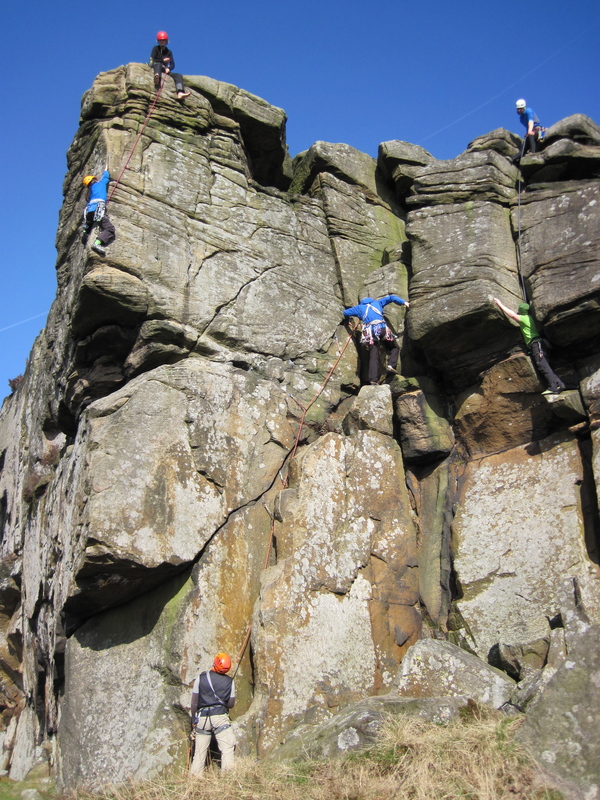 Rock climbers also apparently like the band Earth, Wind and Fire and the film The Virgin Spring. I can’t think of a reason why rock climbers would particularly like them other than the names might represent, respectively, a really bad day climbing and a really good day climbing. The most surprising finding is that rock climbers like eating gruel. It’s a food that I associate with workhouses and which has such negative connotations I didn’t think anyone would choose to eat it. Maybe it’s because rock climbers have, according to YouGov Profiler, little disposable income and so can’t afford enough oats to make a decent porridge. To test YouGov Profiler a bit more, I then entered “mountaineering.” Again I found a mix of the relatively predictable and the odd. I can understand that people who like mountaineering may be more likely to live in Wales or the Midlands as it’s in easy reach of outdoor activity opportunities. As they might need a robust and practical vehicle to get to the next mountain, their preference for driving Land Rovers is also understandable. That mountaineers are more likely to work in the military and defence industry or as a consultant I might not have guessed, but seems to make sense. I don’t understand why mountaineers are more likely to have Tournedos Rossini as their favourite dish. To be honest, I had to look this dish up – it’s basically filet mignon, pan-fried in butter and served on a crouton with foie gras and garnished with black truffle and a Madeira demi-glace sauce. It sounds quite posh and probably impossible to cook on a camp stove. I’m also intrigued that mountaineers are more likely to describe themselves as well educated, but occasionally nerdy, taciturn and a pushover. I wonder too why they have Dr Feelgood as a favourite band and to have recently watched Family Guy or Frasier. Added together, these features don’t quite fit with the mountaineers I know. It is possible that people are just a bit weird and aren’t always completely truthful about what like, but another explanation for some of YouGov Profiler’s odder results may be the methodology behind it. YouGov states that the data in the YouGov Profiles (which YouGov Profiler takes its results from) draws on a “connected data vault which holds over 120,000 data points, collected from over 200,000 UK YouGov members.” Despite this only 66 of these members expressed an interest in rock climbing and only 92 liked mountaineering. I admit that rock climbing and mountaineering are niche activities, but I find it hard to believe that they are that niche. I would have thought that in a sample of 200,000 you would have to deliberately exclude scores of people to only find 66 people who liked rock climbing. Have I just massively over-estimated the popularity of my pastime or are YouGov members just less likely to go rock climbing? 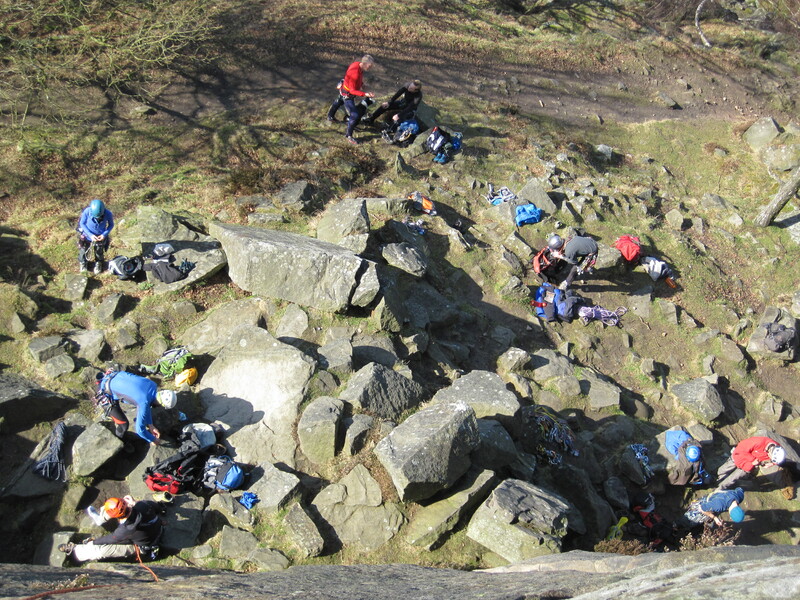 Rock climbers at the bottom of Froggatt Edge. Such small sample sizes inevitably lead to questions about the accuracy of the results. YouGov admits that the larger the sample size the more confident it is to be about correlations, but states that even a small sample size can give results that still show a lot about a particular group. YouGov is careful to explain that the app doesn’t show an average fan or customer, but shows the quintessential member of a group. This group is compared against their “natural comparison set.” YouGov give the example of fans of Downton Abbey being compared against everyone who has rated any TV shows. This means that if YouGov Profiler shows that a particular group is more likely to have a particular characteristic, it is only more likely in relation to the comparison group (not, for example, the whole UK population). It also doesn’t mean that the whole group shares this particular characteristic. YouGov Profiler gives a score for the size of the difference with the comparison set and most of the characteristics in the results for rock climbing and mountaineering only had a medium level of difference. The big difficulty I have when trying to interpret the results of any YouGov Profiler search is that it doesn’t tell you who the comparison set are and I don’t know what questions people were asked. So the results I’ve found could show that there are a few secret gruel-eating rock climbers out there or that rock climbers just eat more gruel than, for example, other people who participate in sport. That’s still a bit weird, but not as weird as it might be. This makes sense. 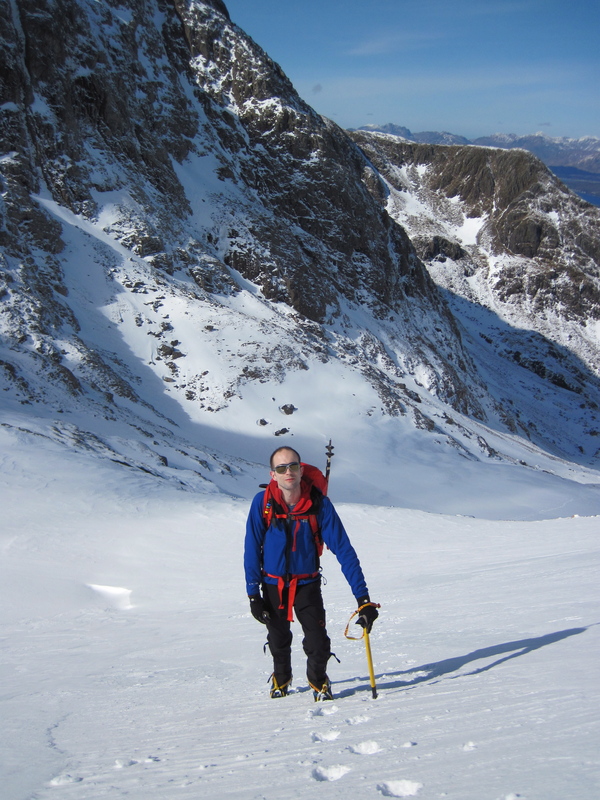 Although serious climbers do buy North Face clothing and gear, the company also seems to have lots of customers who have never done anything more adventurous in their North Face down jacket than walk the dog and take their Land Rover on the school run. Liking The Muppets is a little unexpected, but then The Muppets are cool and so it’s understandable that The North Face customers like them. I then discovered how much fun it is to enter random things into YouGov Profiler and see the unexpected results that come up. I was amazed to find that 1,772 YouGov members like alpacas. I have nothing against alpacas. They are cute and furry plus their wool makes really nice scarves. But 1,772 YouGov members like alpacas and only 66 like rock climbing? How is it that a popular sport that tests mental and physical prowess in beautiful natural settings is less popular among YouGov members than furry South American camelids? According to YouGov Profiler, people who like alpacas are apparently more likely to be ABC1, work in Research / R&D or Healthcare and Medicine and have pad woo sen as one of their favourite dishes. They also have looking after their pets as a pastime and Babe: Pig in the City as one of their favourite films (this doesn’t feel particularly surprising). People who like alpacas are more likely to describe themselves as original and sensitive, but occasionally withdrawn and depressed (maybe alpacas are not good at returning affection?). Through my searches of YouGov Profiler I also found out that people who like Kendal Mint Cake are much more likely to enjoy eating prawn nigiri sushi and have Paths of Glory as a favourite film. I discovered that the 3,930 YouGov members who read Terry Pratchett are more likely to have mettwurst as one of their favourite dishes, own a cat and read New Scientist. The 248 British YouGov members with a special interest in North Korea are more likely to describe themselves as clever and imaginative, but occasionally apathetic, big-headed and cruel. They are also more likely to read Viz comic and have video games as a pastime. I’m not totally convinced by the accuracy of some of the results given to me by YouGov Profiler and doubt that I would use it for working out a marketing plan aimed at rock climbers. I would probably use instead Sport England’s participation in sport survey and it’s associated Active People Interactive app. However, to be fair, YouGov Profiles is a generally well-designed app that makes easily available a lot of information and which probably works well when the samples are of a reasonable size. It’s also a free taster of a bigger piece of software that probably does a lot more. YouGov Profiler is fun, illuminating and puzzling, but I’m not sure it really tell me who the quintessential climber is. I’m pleased that you liked the post. I agree. You need to be able to laugh at yourself and it certainly helps when the heavens open when you are half way up a pitch or you disappear up to your knees in a bog.